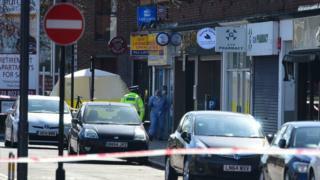 Detectives said the shop's till had been stolen and may have been dumped somewhere by the robber. The murder has been described as a "tragedy" by locals. No arrests have been made. Det Ch Insp Simon Stancombe said: "This was a violent robbery that has escalated, resulting in the murder of a man." Local business owner Peter Brook, who lives nearby, said the newsagents' employees delivered the morning papers to nearby businesses and were "kind, polite and so committed to working in the local community". Image caption Local people described the murder as a "tragedy"
The 55-year-old, who has lived in Pinner for nearly two decades, added: "People sometimes don't appreciate the people who come out at 5am to deliver a service to the local community. When people like that are murdered going about their job it's such a tragedy." Policing minister and Pinner MP Nick Hurd said he was "deeply saddened" by the news. He tweeted that police had increased their presence in the area and were carrying out house-to-house inquires. There have been 29 deaths classed as "homicides" in London this year, including 13 in March.